For observers in the Northern Hemisphere, the constellation Scorpius appears low in the southern sky on warm June evenings. There's a giant scorpion hovering overhead, but have no fear. This creepy crawler is actually the constellation Scorpius. It's all sparkle and no sting. In his book "The Stars in Our Heaven – Myths and Fables," (Pantheon Books, 1948) author Peter Lum writes: "The scorpion is essentially a creature of darkness, a furtive little animal that lurks in the shadows, hides under stones or in any dark crevice and cannot bear to face the light … only at night does it come out in search of its prey. Although seldom fatal (its sting) is extremely painful; hence the scorpion is usually disliked, feared and avoided by anyone who has ever come in contact with him." And if you face due south at around 11 p.m. local time this week, you may be able to get the best view of this magnificent star pattern — the constellation Scorpius — which ironically represents a lowly, creepy-crawly thing that has few friends. Scorpius is a constellation that can be best appreciated by southerners. Those who live in the far-northern United States, southern Canada or the British Isles will have part or even all of its tail hidden below the southern horizon. 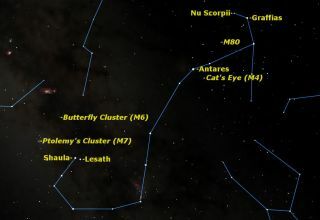 As one progresses farther south, the Scorpion slowly climbs the southern sky. For those who live in Australia, New Zealand, South Africa, northern Argentina, Uruguay, most of Brazil, northern Chile and southern Peru Scorpius lies directly overhead. The Milky Way Galaxy passes through the lower extremities of the Scorpion. Here clouds of stars and dark interstellar dust combine in a bewildering array as seen in binoculars andamateur telescopes. The Scorpion's brightest star is the first-magnitude Antares, displaying a reddish hue. To the ancients, this distinctive red color suggested the planet Mars and the name Antares means literally "The Rival of Ares," Ares being the Greek name for the God of War. I've always felt that even on those occasions when Mars outshines Antares, it still rivals Mars in terms of its fiery color. The so-called Red Planet actually glows with an orange-yellow luster, whereas the star Antares always glows with ruddy hue. In the time of Confucius, Chinese astronomers called this star Ta Who, 'The Great Fire." Antares is a cool, red supergiant star, about 604 light-years away. It is 9,000 times more luminous and about 700 times the diameter of our sun. If our solar system were centered on Antares, the orbit of the Earth would easily fit inside the star. Put another way, if we could reduce our sun down to the size of a baseball, Antares would be a globe measuring more than 134 feet (nearly 41 meters) in diameter! Yet, despite these impressive statistics, it should be noted that the overall density of Antares is less than one-millionth that of the sun. Antares is also relatively cool as stars go, only about 6,500 degrees Fahrenheit (3,593 degrees Celsius) compared to 11,000 degrees F (6,093 degrees C) for the sun. The star's low temperature accounts for its ruddy color. Antares also has a small, very hot companion, bluish-white in color, but yet has been described appearing as "… a little spark of glittering emerald" because of its proximity and contrast to ruddy Antares. The two stars orbit each other over a span of nearly 900 years, separated by a distance of about 500 times Earth’s distance from the sun. Of all the constellations, only Orion can boast more bright stars than Scorpius. And indeed, there were mythological reasons for the scorpion's placement in our summer sky. The most famous legend has Scorpius representing the creature that stung Orion, the Mighty Hunter to death. To honor Orion, the Scorpion was placed opposite him in the sky, so that these celestial antagonists will never meet again. And supposedly that's why when Orion is disappearing below the western horizon during spring evenings, the Scorpion is beginning to poke his head up in the southeast. Editor's note: If you snap an amazing photo of the night sky and you'd like to share it for a possible story or image gallery on SPACE.com, please send images and comments, including equipment used, to managing editor Tariq Malik at spacephotos@space.com.